Stay for supper and a chat. Our meetings are held at North Nowra Community Centre, 7 Hood Cl North Nowra at 7.30pm. Everyone is welcome. We publish a Newsletter every month from February to November, which keeps members up to date with the next month’s activities as well as reporting on the interesting walks and activities that have occurred during the month. Members of Australian Plants can see here for latest newsletters. This garden is located at Jervis Bay Maritime Museum Complex in Huskisson. 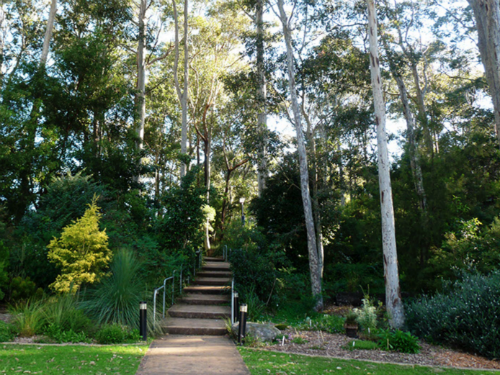 The original garden, started by the Nowra Group in 1985, was known as the Lady Denman Garden or the Husky Garden. Competition for scarce water resources from many trees on sloping clay ground made the choice of site questionable. The disastrous bushfires of Christmas 2001 saw the garden almost destroyed. Although some plants survived and regenerated strongly, most were wiped out. Badly damaged trees had to be removed allowing more sunlight to enter the garden. A positive outcome of the fire was the chance to rethink and revamp it. A mounded garden was formed to display plants at their best and catch much needed water. A new garden theme was adapted, “Linking Local Flora to Fauna“ to highlight local wildlife’s dependence on local plants. A decision was made to give the Garden its own name and in 2003 it was renamed 'Wirreecoo Wildflower Garden'. The Nowra Group continues to maintain the garden with working bees.